Well there was a small problem with the mudflaps... Above 50mph they stopped being flaps and started being wings! The rubber sheeting wasn't stiff enough to keep the flaps in position when the wind speed increased. After some thought and dismissing of a few ideas I have come up with a simple and hopefully reliable solution. It was also cheap and very easy to install - however at the time of writing I don't know how it will work. I used a couple of wire coat hangers bend into a U-shape which hangs over the top of the mudflap (inside the wheelarch) and then rests against the mudflap. 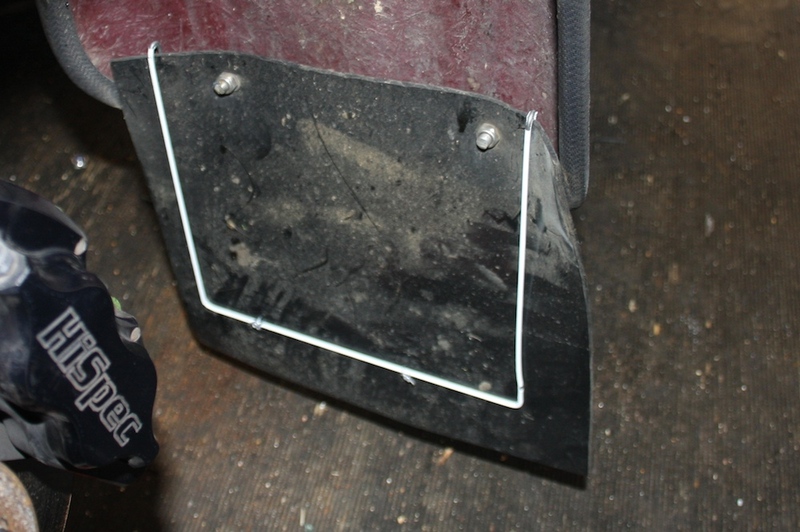 Now obviously this is not going to do anything if the mudflap is free to move - so to counteract this I have installed a couple of wire ties going through the mudflap. This should fix the problem - and it if doesn't then I will think again - as it only cost a couple of dry cleaning coat hangers then it won't be expensive to redo.